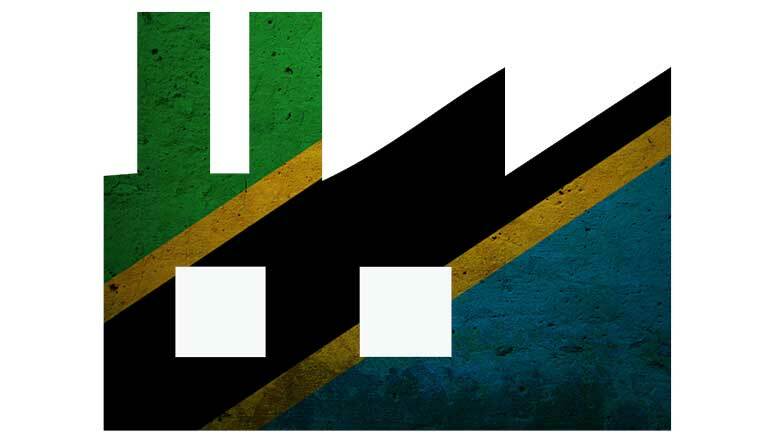 The industrial sector of Tanzania is comprised of manufacturing (53%), processing (43%), and assembling industries (4%). The manufacturing sector in Tanzania consists mainly of food processing (24%), textiles and clothing (10%), chemicals (8.5%), and others. Since agriculture is the mainstay of the Tanzanian economy, the manufacturing industry is centered around the processing of local agricultural goods. Currently, the majority of crops in Tanzania are marketed in their raw forms, while value-addition to agricultural products is mostly done on small-scale secondary level. Still, the Tanzanian agriculture value-added net output rose by 61% during the period 2009–2014, from USD 8.6bn to USD 13.8bn. Currently, value-added products in Tanzania include cotton yarn, manufactured coffee and tobacco, sisal products (yarn and twine), and wheat flour. Tanzania aims to become a semi-industrialized country by 2025, for which the contribution of manufacturing to the national economy must reach a minimum of 40% of the GDP. To achieve this, Tanzania aims to transform from being dominated by natural resource exploitation activities and extractive industries (agriculture, tourism and mining) to become an economy with a broad and diverse base of manufacturing, processing and packaging industries that will lead both the productive as well as the export trade sector. Foreign Direct Investments (FDIs) are expected to provide the capital for the desired industrial development. According to President John Magufuli’s speech during the inauguration of the new Parliament at the end of 2015, industrialization will be a key priority to the government. Industries, producing goods for mass consumption, such as clothes, textiles and edibles, will be encouraged. The Government will also focus on electricity development, which is a necessary step for achieving industrialization, President Magufuli announced. In addition the Government will support Tanzania’s industry through the establishment of an industrial development bank and reduction of taxes on locally produced goods. In addition, the Government will strengthen the Tanzania Investment Bank (TIB) and establish an industrial development bank to accelerate industrialization in the country. On October 6th 2016, industrial conglomerate Bakhresa Group of Tanzania launched a TZS261b fruit processing factory in the Mkuranga district near Dar es Salaam. TanzaniaInvest had the pleasure of interviewing Dr. Adelhelm Meru, Permanent Secretary of the Tanzania Ministry of Industry, Trade and Investments. The African Development Bank (AfDB) will support Tanzania’s 2016–2017 budget with USD200m. Chinese Investors plan to invest USD100m in the construction of a tile plant in Mkiu Village, Mkuranga District, Coast Region of Tanzania. Industrial group Kamal of Tanzania recently launched its TZS10b heavy oil refinery in Tanzania.